You can learn a lot about a person by asking them who their heroes are. The people we admire tell us a lot about what we value, what we hope for, and who we want to become in the course of our lives. The Church canonizes Saints who are shining examples of faithfulness to Jesus Christ, who show in their own lives what it means for a human being to become a brilliant icon of holiness. The Saints are as varied as people are, for we each have unique personalities. Their distinctive examples inspire us to unite ourselves fully to Christ and, thus, to become our true selves in His image and likeness. 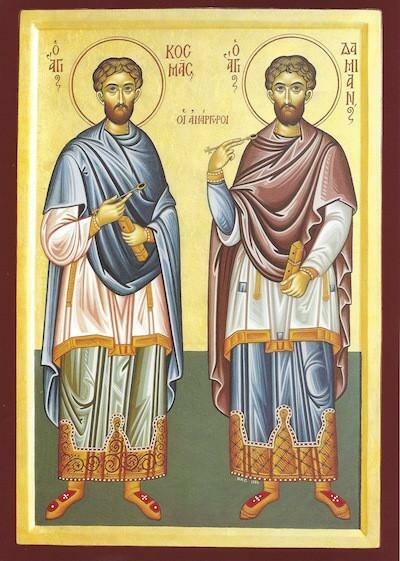 Today we commemorate two Saints with whom we may think that we have little in common. St. Paul of Thebes was the first Christian hermit, living for 91 years in a cave in the Egyptian desert in constant prayer in the third and fourth centuries. His diet consisted of dates and bread, which a raven brought him. God revealed to St. Antony the Great that St. Paul was more advanced in the ascetic life than he was, so he went to visit him. When Paul died, Antony saw his soul ascend in glory to heaven surrounded by angels, prophets, and apostles. We also commemorate today St. John the Hut Dweller, who left the wealthy home of his parents to become a monk in the fifth century. He eventually returned to Constantinople, where he hid his true identity and lived as a beggar outside his parents’ home for three years, where he prayed for them constantly, endured abuse and ridicule, and suffered from the lack of adequate clothing and shelter. Before his death, John revealed his identity to his parents, who built a church and hostel for strangers on the site of his grave. These men are not regarded as heroes in our culture, and few of us know much about them or have taken them seriously as models for our lives. On the one hand, that is understandable because only a minority of Christians hear the calling to follow the difficult ascetical path of monasticism, which receives great honor in the Church precisely because it is such a stark and demanding example of what it means to take up our crosses and follow Christ. But on the other hand, these two Saints should intrigue us all because they demonstrate that people of flesh and blood, with all our common weaknesses, may still resist temptation and press on to grow in holiness in profound ways. If anything, their temptations were greater than ours because of the difficulty of their path and the attraction to any human being of what they gave up: physical comfort, family relations, and what we think of as a normal life in the world. We are not desert fathers and mothers or famous ascetics. We are average people who live fairly conventional lives. We are not ready to take on the stark choices and challenges that we see in the lives of St. Paul or St. John. Nonetheless, our daily struggle to turn away from slavery to self-centered desire and corruption is simply another version of their path, and it too has eternal consequences. In all that we say, do, and think each day, we have the freedom to unite ourselves more fully to Christ in holiness or to distance ourselves from Him. We may become more beautiful living icons of His salvation or uglier and more deformed distortions of what it means to be in God’s image and likeness. We may become epiphanies of His salvation or of the consequences of repudiating our true calling in life. That is a choice that each of us makes every moment. We may be tempted to ignore the calling to holiness that Christ places upon each of us due to our particular history of personal brokenness, our busy schedule, or whatever set of difficulties that we and our loved ones face. It is a temptation to think that sharing more fully in our Lord’s life is only for those with no problems, no history of doing the wrong thing, and no strong pull in the other direction. Yes, that is simply a temptation and we must identify and reject it as such. God calls us all to be faithful in our present circumstances, for those are the only circumstances that are real. Instead of dreaming that someday, when all is well, we will become really holy, we should take the steps that we are capable of today to orient our lives more fully to the Kingdom of God. In the world as we know it, all will never be well and we will never be without excuses and distractions. Now is the time to live as those clothed with a robe of light, as those who have put on Christ in baptism like a garment, who have died to sin and risen with Him to a new life of holiness. This Samaritan was not someone free from problems and distractions. No, he had them as much, if not more, than anyone else in his time and place. But he used his weakness and pain to open his soul in humble gratitude to Christ. Perhaps it was precisely because his path had been so difficult that he alone went back to thank Him. We can learn from his example to be thankful for every blessing, every bit of strength and healing, and every glimpse of truth into the true state of our souls. This man was not perfect, but He called for mercy from the depths of His heart, “Jesus, Master, have mercy on us,” obeyed the command to head to Jerusalem to show himself to the Jewish priests (which must have been very difficult for him as a Samaritan), and then alone returned to give thanks. The Samaritan leper surely had may opportunities for spiritual struggle built into his life. The same is true for all of us in one way or another. Remembering his example, and that of St. Paul of Thebes and St. John the Hut Dweller, let us embrace every opportunity to die to self and sin as we open our hearts and souls to the healing mercy of Jesus Christ. God does not call us all to become monks and nuns or famous ascetics, but He does call us all to become holy by repentance and faith. That is how we may all prepare to appear with Him in glory. Thank you for these inspiring words Fr. Philip. You are right; now is the time to turn our lives over to Christ – no more excuses!